Located in St. Louis County real estate, homes for sale in Kirkwood MO are located in the inner ring of St. Louis County. Although minutes from Downtown St. Louis, Kirkwood is a charming area with historic homes and a small town feel. There are over 300 thriving businesses including many boutique stores and small business owned shops. Kirkwood MO Real Estate and Kirkwood MO properties are a perfect addition to the St. Louis Real Estate market. Kirkwood real estate is made up of both well established and new construction homes. These single family homes offer floor plans with 2 bedroom, 3 bedroom or 4 bedroom options. Kirkwood MO homes for sale range in price from about $100,000 to about $1,000,000. The median home price in 2014 was approximately $365,000. Residents of Kirkwood enjoy the Farmers market that is open April-Sept, 6 days a week. Kirkwoods historic train station brings visitors along with travelers jumping on the Amtrak to visit hundreds of cities throughout the US. If you are considering buying a home in Kirkwood you will be pleased with the statistics for the Kirkwood school district. The U.S. News & World Report released their 2015 “Best High Schools” list of top-ranked Missouri schools today and Kirkwood High School was ranked No. 3 on the list. The Kirkwood school district includes a pre-school, five elementary schools, two middle schools along with Vista a school for unique needs. See Great Schools for up to date ranking on every school in the area. If you are looking for a homes for sale in Kirkwood MO or you would be interested in buying a home in Kirkwood, please contact St Louis County real estate expert, Sharon Colona and St. Louis Realty for a professional and simple buying or selling process. Call (636) 397-7653 or email at scolona@stlouisrealty.net. Stunning Builder display in private 10 home enclave in Chapelwood Estates, Kirkwood. Gorgeous exterior elevation w/ 3 car garage & 8' tall double doors. Interior boasts vaulted gathering room w/ decorative beams, bookshelves, gas fireplace w/ stone surround, formal dining room, planning niche & a stunning hearth room that includes vaulted ceilings & double patio doors. The kitchen is perfect for entertaining w/ an over sized island, Cambria quartz counters, 42' cabinetry w/ crown molding, Jennair under mount microwave, 5 burner gas cook top & double ovens. Get away from it all in the master retreat w/ large sitting room as well that includes cabinets & a mini fridge along w/ a large walk in closet that leads directly to a laundry room w/ built in cubbies & cabinets. The master bath has separate sinks, floor to ceiling tiled shower w/ rain shower head, jets and a soaking tub. Elegant staircase w/ wrought iron spindles leads to 2nd floor w/ large flex room, skylights & spacious bedrooms. New price: $859,000. Saturday open house (04/20), 1-3 p.m. Spectacular custom 2-story home, with 5 bedrooms/4.5 bathrooms, in prime Kirkwood location. Gorgeous details throughout, open floor plan and spacious rooms. Hardwood floors on the 1st and 2nd floors. The entry is flanked by the dining room and office, with beamed ceiling, through French doors. The family room, with gas fireplace, flows into the spectacular chef's kitchen with Bertazzoni gas range, stainless steel appliances, granite countertops and custom cabinetry. Spacious second floor master bedroom suite opens to the luxurious master bathroom with vaulted ceiling. Three additional bedrooms with one ensuite bedroom. Second floor laundry. Partially finished lower level with recreation room, 5th bedroom, full bathroom and exercise room. Niles IntelliControl speaker system. Large covered deck overlooks the heated pool. Detached 2-car garage with carriage house. Fenced with automatic gate. Near Downtown Kirkwood. New custom 2-story home under construction by Prestige Custom Homes in Kirkwood. This 5 bedroom, 4.5 bath home joins 2 other new homes in a row on N. Woodlawn and features a 3-car garage, 9' first floor ceilings, fireplace, custom cabinets with soft close drawers and doors, lazy susan, double trash pullout, crown molding, stainless steel appliances, Quartz countertops, large island, job stained hardwood flooring on first floor and 2nd floor hall, wainscot trim in dining room, 7 1/4 crown molding on 1st floor, 6 1/2 base molding, large large master bedroom with coffer ceiling and two huge walk-in closets, vaulted master bath suite with separate tub and shower, adult height vanity, granite countertops, bay windows, tall basement pour, finished lower level with rec room, full bath, and bedroom. Welcome to the Fry-Bodley-Gratz House built in 1857 located in the North Taylor Historic District in Downtown Kirkwood! This beautiful renovation in 2018 has been recognized by the Kirkwood Landmark x2019;s Commission for preserving the original architectural integrity of this historic property. Step off the front porch & walk to all that downtown Kirkwood has to offer; dining, shopping and more. The stunning interior boasts a first floor master suite with a spacious bath & custom walk-in closet. Enjoy entertaining in the light filled kitchen around the granite island which opens to the dinning & great rooms which feature 2 new gas fireplaces. High ceilings, new hardwood floors, room flow & an abundance of windows, make this home ideal for today x2019;s lifestyle. Upstairs features 3 additional bedrooms & 2 new full baths. The expansive 3rd floor can easily be refinished for additional living space while the cellar & loft in the detached oversized 2 car garage provide ample storage. New custom 2-story home under construction by Prestige Custom Homes in Kirkwood. This 5 bedroom, 4.5 bath home joins 2 other new homes in a row on N. Woodlawn and features a 2-car garage, 9' first floor ceilings, fireplace, custom cabinets with soft close drawers and doors, lazy susan, double trash pullout, crown molding, stainless steel appliances, Quartz countertops, large island, job stained hardwood flooring on first floor and 2nd floor hall, wainscot trim in dining room, 7 1/4 crown molding on 1st floor, 6 1/2 base molding, large large master bedroom with coffer ceiling and two huge walk-in closets, vaulted master bath suite with separate tub and shower, adult height vanity, granite countertops, bay windows, tall basement pour, finished lower level with rec room, full bath, and bedroom. Tired of the standard traditional new home designs? Then you're gonna love the edgy style and modern open floor plan at 922 Cleveland. Character abounds in this black and white themed home with an industrial/modern vibe. You'll enter into a light-filled great room with views all the way through to a huge rear deck perched above a gracious back yard. The crisp white cabinets and warm gray counters in the kitchen set the stage for entertaining at the massive center island. Cooks will LOVE the full-size refrigerator & separate full-size freezer, and double ovens! A main-level master suite is strategically placed for privacy but has easy access to the laundry and main living areas. Upstairs are 3 over-sized bedrooms including one that could be used as a second master suite and two that share a Jack-n-Jill bath. There's also a walk-out lower level with a large rec room (still being completed), bath, and rear patio. This is truly an amazing and unique home on a block w/ many new homes. The Entertainer's Dream. If you love hosting events, this one is for you. This four bed/four bath beauty has enough room for your friends, family, plus all your neighbors. Every corner of this home is beaming with beauty. The gorgeous foyer with newly stained floors lead you right into paradise. The elegant master suite with large walk-in closet and laundry are on the main floor. Large loft with lots of room to play and large surround desk used for computer station and homework. The recreation room is nothing short of spectacular and is full of wonderful games, wet bar, family room, exercise room/office that can also be made into a sizable sleeping room. Skee ball and pinball machines, wooden swing set, and trampoline are all available for purchase. As if that weren't enough, let the ambiance take you away around the inground pool. This will be the perfect setting for all your summer nights and will make every day and evening relaxing for you and fun for the kids. Come sail away. Welcome home to this extraordinary oasis nestled in the trees. Striking views and abundant natural light fill the 2-story great room with raised hearth fireplace & brick surround. Dining/Hearth room with fireplace opens to Expansive kitchen. - A TRUE chef x2019;s dream showcasing sleek stainless steel Wolf appliances, sub-zero fridge, custom cabinets, & decadent counters. Luxurious vaulted main floor master suite offers private access to decks, Walk-in closet with custom built-ins & exquisite master bath complete with freestanding soaking tub + huge custom shower with skylight. Upgraded Powder room rounds out 1st floor. Climb the stairs to a generous bonus area, hall bath & 2 large bedrooms. Finished walkout lower level highlights a 3rd fireplace, custom built-ins, wine storage, & 2nd powder room. Multi-level decking surrounds this truly exquisite home & provides plenty of outdoor lounging overlooking 1.5+ acres of wooded area. Abundant upgrades throughout- Come see for yourself! SHOWINGS START AT 12:30PM SATURDAY!! Another Striking Home Just Completed by MRM Manlin Development Group! 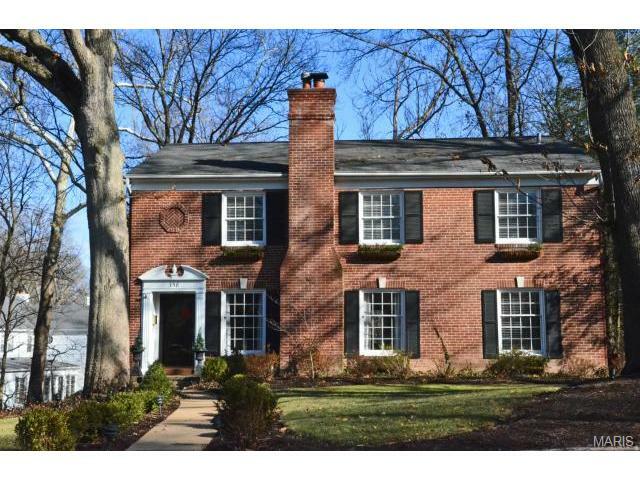 Fabulous Location~ Walking Distance to Downtown Kirkwood. 5 Bed 3.5 Bath 2 Story with a Finished Walk Out Lower Level. Sophisticated Style and Rich Finishes. Hardwood Flooring, Wainscoting, Crown Molding, Built in Bookcases Featured on the Main Level. Great Room w/ Direct Vent Fireplace. Separate Dining Room with Recessed Lighting and Sculptured Ceiling. Center Isle Kitchen, Creamy White Cabinets, Under Cabinet Lighting, Decorative Tile Backsplash and Quartz Counter Tops. Breakfast Area Walks Out to a 11 x 12 Deck with Stairs to the Yard. Main Floor Laundry. Grand Master Suite with Coffiered Ceiling and Recessed Lighting, Walk in Closet, Luxury Master Bath w/ Separate Soaking Tub, Tiled Shower and His and Her Vanities. Finished Lower Level includes 5th Bedroom, Full Bath and Family Room and walks out to Covered Patio and a Fabulous Level Yard. Bonded Builders Warranty Included. 1309 Ann Avenue is an impeccably built home with a high level of quality evident in every detail! The gorgeous hardwood floors and incredible natural light immediately set a tone of comfort and sophistication. The gourmet kitchen is a cook's dream with quartz counters and stainless steel appliances including a Wolf range. The first floor master suite is a true retreat with dual custom closets and a spa-like bathroom featuring a soaker tub and a glass shower equipped with 12 shower heads! The spacious second level has three additional bedrooms, 2 full baths and a large bonus room. Abundant custom built ins and closets provide endless options for storage and organization. The finished lower level includes an additional bedroom, full bath and rec room with access to the private back yard and a one-of-a-kind tree house! Please note: main floor laundry paired with convenient laundry shoot, attached 2 car over-sized garage. New Luxury 2 Story offered by Kirkwood's premier builder Mahn Custom Homes! This custom home features an open floorplan, Job Finished Hardwood Flooring, Family Entry off Garage with Cubbies, Shared Bath Plan, and 2nd Floor Laundry. Master Bath offers a 60 x201D; Free Standing Tub, Subway Tiles at custom Master Shower to ceiling, and Ceramic Tile Flooring. Kitchen features Painted White Cabinets and Painted Accent Island, Large Island, Quartz Counter Tops, White Subway Tile Back-splash, and Frigidaire Appliances. This home also includes an high level of fit and finish, Moen Gibson Collection Faucets, Pedestal Sink at Power Room, Kohler Elongated Toilets, 5 Panel Doors, Kwikset Tustin Satin Nickel Interior Doors, Custom Stained Mahogany Front Entry Door, Direct Vent Fireplace with Marble Surround, 3 xBC; Door and Window Casing, 5 xBC; Base Molding, Crown Molding, Recessed Long Panel Garage Doors with Glass, Custom Lighting Package, and Recessed Lighting! More properties available in the area! Stately colonial beauty brimming with all of the elegance and character historic Kirkwood was built upon, beautifully updated for today's lifestyle. Located in this beloved and well-established enclave where neighbors host seasonal get-togethers, holiday parties, and hayrides, you x2019;re greeted with exceptional curb appeal and expansive outdoor living space with xBD; acre level lot, 2 roof top decks, covered side porch, patio w/ firepit, and rear entry attached 2 car garage w/ room for work space. Inside, you'll find the center hall entry contributes to the great flow of the home, perfect for entertaining w/ 2 main floor living areas, luxury kitchen w/ custom cabinetry, designer lighting, & front and rear staircases. Lg master w/ en-suite and 3 additional bedrooms upstairs, finished basement retreat downstairs. 3300 sqft+ of living space, newer systems, windows, roof, HVAC, flooring, gas fireplaces, gutters & more. Seller wishes they could take this gem with them! CUL-DE-SAC LOT!!! New Luxury Home offered by Mahn Custom Homes! This custom home features an open floorplan, Job Finished Hardwood Flooring, Family Entry w/ Cubbies, Butler x2019;s Pantry, Shared Bath Plan, 2nd Floor Laundry. Master Bath offers a 60 x201D; Free Standing Tub, Subway Tiles at Master Showe, Ceramic Tile Flooring. Kitchen features Painted White Cabinets, Large Accent Island, Quartz Russo Counter Tops, White Subway Tile Backsplash, and Frigidaire Appliances. This home also includes an high level of fit and finish, Moen Gibson Collection Faucets, Pedestal Sink at Power Room, Kohler Elongated Toilets, 5 Panel Riverside Interior Doors with Kwikset Tustin Handsets, Custom Stained Mahogany Front Entry Door w/ Glass, Direct Vent Fireplace with Carrara Surround, 3 xBC; Door and Window Casing, 5 xBC; Base Molding, Crown Molding, Recessed Long Panel Garage Doors with Glass, Custom Lighting Package, and Recessed Lighting!!! If this is not the right lot or home, the builder has more to choose from! Classic Kirkwood charm eloquently blended with newer construction and custom built features. Only 11 yrs old, this 3600 sq ft home is ideal for the growing family! Open spacious floor plan! Glistening hardwood floors flow throughout the main level; Arched doorways, crown molding, deep baseboards, two-panel doors and plantation shutters; Chef x2019;s kitchen with center island/breakfast bar, granite counters, sleek SS appliances, custom cabinets with crown molding. Master Suite with double door entry and luxurious bath with impressive custom, walk-in shower, his/hers vanities, his/hers walk-in closets & corner soaking tub. Three additional bedrooms, two with walk-in closets share a Jack-n-Jill Bath and the third makes a great office space or guest room; Upper level bonus area & built-in reading nook, too! HardiePlank Siding, architectural roof, zoned HVAC, Pella windows; Fenced yard; Covered front & back porches! Just blocks from downtown Kirkwood! Location,Location: IMMEDIATE POSSESSION. New custom 2-story home just completed by Prestige Custom Homes in Kirkwood. This 5 bedroom, 3.5 bath home features 9' first floor ceilings, fireplace, custom cabinets with soft close drawers and doors, lazy susan, double trash pullout, crown molding, stainless steel appliances, Quartz countertops, large island, job stained hardwood flooring on first floor and 2nd floor hall, wainscot trim in dining room, 7 1/4 crown molding on 1st floor, 6 1/2 base molding, large master bedroom with coffer ceiling and two walk-in closets, vaulted master bath suite with separate tub and shower, adult height vanity, Quartz countertops, bay windows, tall pour, egress window, finished basement with large rec room, full bath, and another bedroom.